Q: How long did it take to excavate the Taxus and the Kousa Dogwood that were growing next to each other? A: It took the better part of a day to excavate and transplant these trees. Because their roots were intertwined, the process took longer than it would have had they been stand-alone specimens. 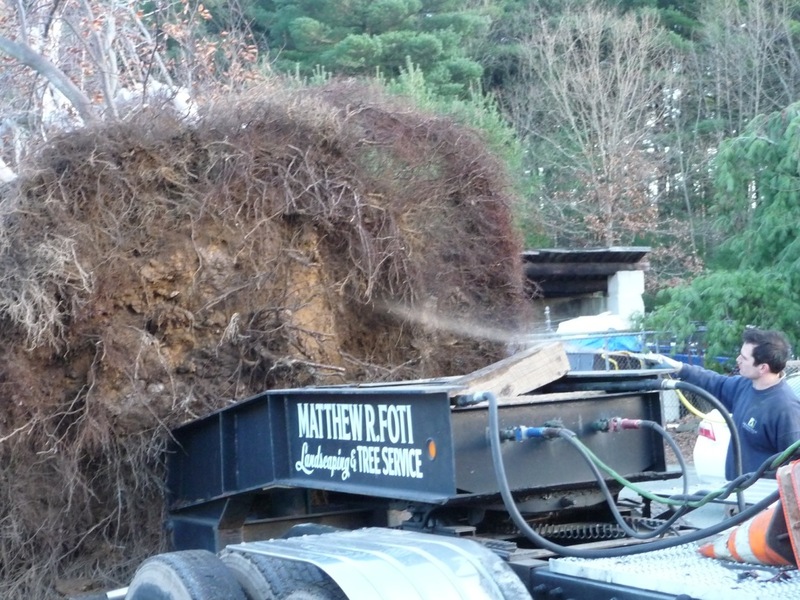 Interwoven roots of two trees to be moved makes the excavating process more time-consuming. Q: Is it necessary to keep the roots moist during the excavation? A: It is a good idea to do so, as compressed air tends to dry soil and roots. Having a hose on hand to spray down the exposed roots every so often makes sense. There has been some discussion among the arborists doing this work that because such a large volume of root mass gets saved, the tree is much more resilient and adaptable to the short period of drying caused during air-tool work. Compressed air will blow off quite a lot of the tiny feeder roots — but they tend to regenerate pretty quickly once planted in the new site, and the ‘reservoir’ of moisture and nutrients in the remaining large roots helps sustain the tree during the excavation and move. I don’t know of any scientific experiments that have been done to date to test this hypothesis — right now, the results are anecdotal — but I’m guessing that we will be hearing in the next few years about controlled experiments that prove or disprove this idea. In the meantime, if you have been transplanting trees bare-root with air tools, feel free to write in and share your experience, and join the community that’s pushing into this new territory. Q: Do you use hydrogel on the roots of air-excavated trees? Jonathan Bransfield spraying down the root plate of a tree with water and a 1% solution of Wilt-Pruf before tarping. Hydrogel was used in the backfill at planting. The newly tarped root plate getting sprayed down with water before the tree's drive to another site. Q: Have you seen any mortality from this method of moving trees? A: There is some evidence that trees with particularly tender bark don’t do well with direct pressure from compressed air. Matt Foti notes that two cherry trees he moved last year died; a few weeks ago he moved a cherry on his own property, and had his crew blow soil out from under the tree, aiming the air in toward the trunk from the blowout trench. He has planted the tree out in his nursery and will watch it for the next year, to see how it respond to the more sensitive treatment. Here’s an instance where the technology is available to do the work, but our knowledge is still catching up with the technology. If anyone wants to do a controlled, scientific study, this species-specific question would be a great one to explore. In the meantime, arborists doing this work will report in as they learn more. 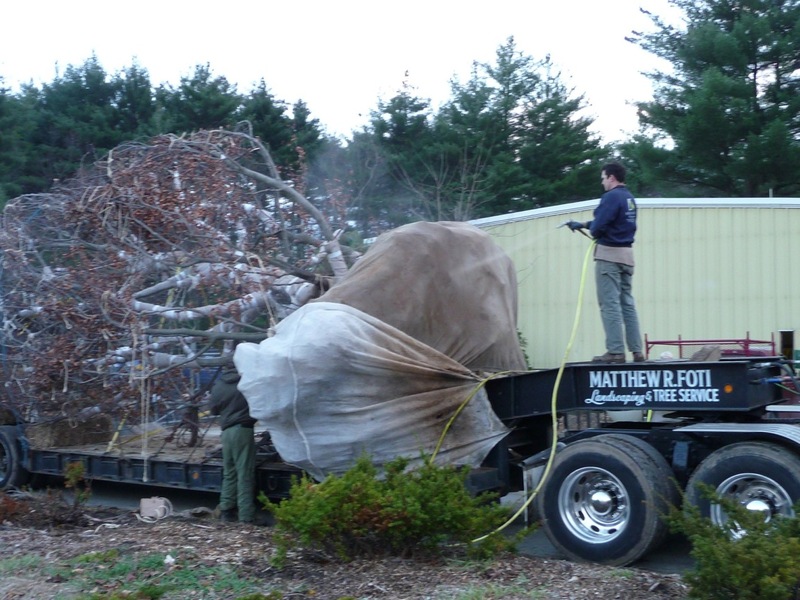 Do you have knowledge about moving Southern Magnolia trees-8″-10″ ? Rufus — Sorry for my delay in answering; for some reason WordPress didn’t tell me about your question. I don’t know specifically about moving large Southern Magnolias, but can suggest that it be done carefully with an air tool. Magnolia bark is quite tender, and so you’ll want to blow soil off the smaller roots, and keep a biggish slug of soil directly under the tree, where roots are largest and root-bark injury could really have an adverse effect on the whole tree a few years down the road. If you do the work, or have done it, and had success, I’d love to see photos and hear about how the move went, and would be happy to post info on it on this site.